Do you have a survival kit in place in case disaster strikes? You should! Every family should have a kit with water, non-perishable food, first aid supplies, flashlights, etc. I’ve created a printable list below to help keep your emergency supply kit stocked and ready! But first, let me tell you about some items in our, personal, survival kit. Clay and I teamed up with MyPatriotSupply.com to show you survival food options. Non-perishable food doesn’t have to be tasteless. It can actually be pretty good! We received, for review, one of their 72 Hour Survival Kits. This kit will keep our family nourished for up to 3 days during a crisis. Our kit came with foods that we have on our regular meal plan so they are something we are used to eating! Because we are a large family, I do wish the kits served 8 for all the dishes instead of 4 for the entrees and 8 for the oatmeal. Otherwise, we have to purchase 2 kits for every 72 hours. Not a huge deal, but still. In my mind, it makes more sense. The food itself is quite tasty. It does have to be heated with water. It’s not ready to eat, but it gives you an option for a hot meal, versus simple peanut butter and crackers. 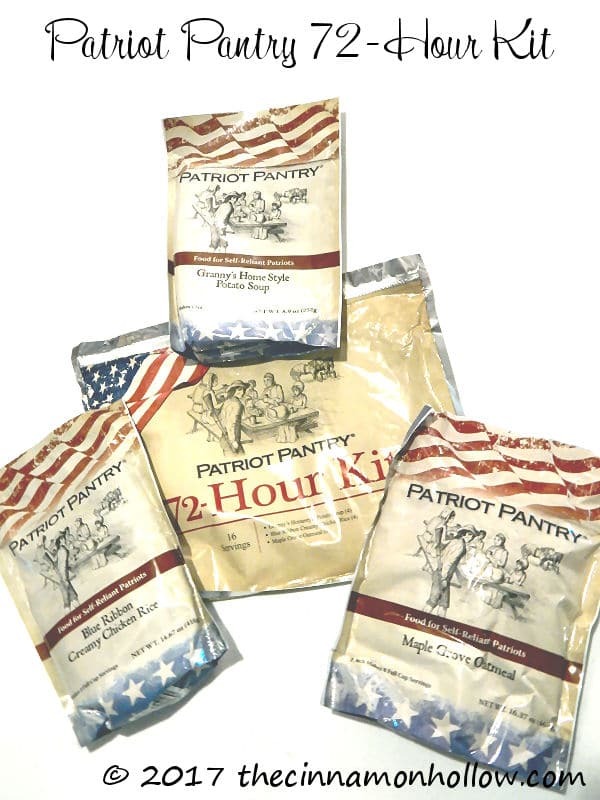 Do foods that don’t require heating for breakfast and lunch and save this food from MyPatriotSupply.com for supper. The potato soup called for 4 1/c cups of water. Bring the water to a boil, whisk in soup mix and simmer for 15 – 20 minutes. The same as store bought soup mixes. And it tastes great! I have a photo of the soup but for some reason it isn’t wanting to upload correctly. I wanted to get this post up so I’ll get that photo added tomorrow. * Your first aid kit is something that should be kept handy at all times and re-stocked as needed. I have a large, fabric cooler that I use but it tears easily. So I’ve decided to switch to a plastic tote with a handle for carrying and easy, waterproof storage. Individual items based on your own needs like blood pressure monitor, glucose monitor etc. Your first aid kit may have more in it than this. This is just a basic guide with items that can be found in most pre-made kits. I found one at Sam’s Club for $20 that had a ton of items in it, including a first aid guide. It also glows in the dark so it can be easily found at night! To store all these items you’ll need a couple large, heavy duty, plastic totes. Place everything in your totes and stack them in an easily accessible location. You want to be able to get to them quickly and easily if there is a disaster. Download your free, printable emergency survival kit list by clicking the button below. I hope these lists come in handy for you. Feel free to print them and keep them in your kits! 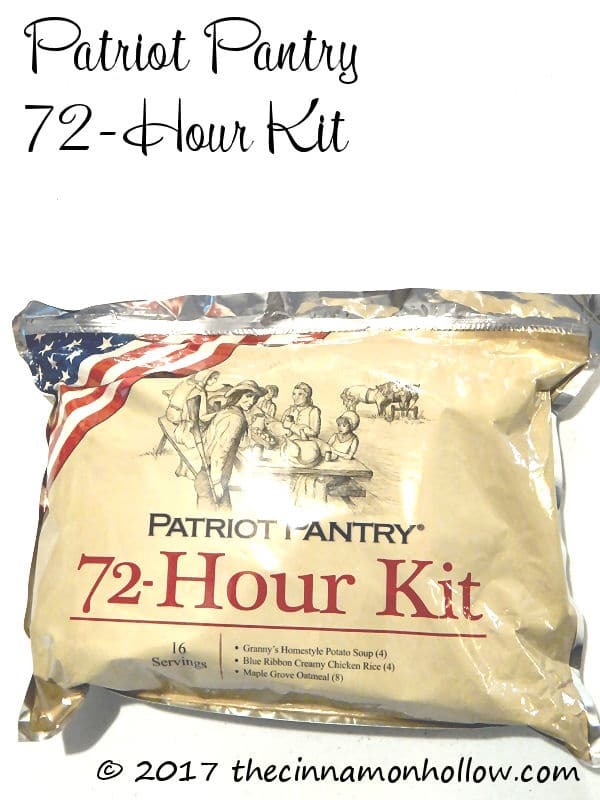 To purchase 72 Hour Meal kits, check out MyPatriotSupply.com. The food is great and they have other items for your Emergency Survival Kit as well! Do you have a survival kit? What are some things, not listed, you recommend keeping in one?